We are a family owned company and have been involved in the sewing and vacuum business for over 40 years. 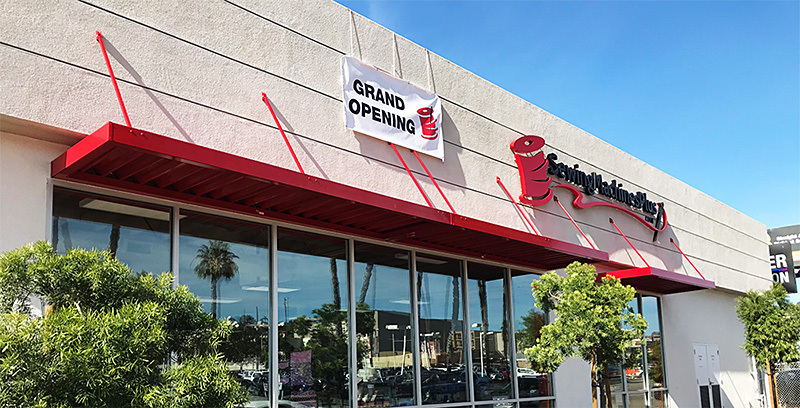 We run a successful sewing machine and vacuum cleaner on-line business and we also have two retail locations to serve Southern California. We have one location in San Marco and a second location in San Diego. Both of our Super Stores have over 10,000 square foot showrooms with huge classrooms to host weekly Sewing classes and monthly events. For the ultimate shopping experience, please visit one of our retail locations or call us toll free for expert assistance. We are located in a shopping center at 713 Center Dr in San Marcos, California. From I-15, take Highway 78 West, get off at the Nordahl Rd. exit, then turn right onto Nordahl. From I-5, take Highway 78 East, get off at the Nordahl Rd. exit, then turn left onto Nordahl. After turning onto Nordahl, the shopping center will be to your left almost immediately. We're located to the left of Kohl's and Wal-Mart, in the large building past Guitar Center and Verizon Wireless.